20917 Color: Teal Features: -Salon table with shelf. -North American Maple and other hardwoods from eco-friendly, managed forest sources. -Shelf base. -Luxuriously upholstered rounded corner top. -Pro-plush deluxe 3-layer 3'' cushioning system. -Buttery soft, yet eco-friendly 100% PU Natursoft upholstery. Product Type: -Stationary massage table. Country of Manufacture: -United States. Dimensions: -Max height: 33". Overall Height - Top to Bottom: -23". Overall Width - Side to Side: -73". Overall Depth - Front to Back: -30". Overall Product Weight: -156 lbs. 20915 Color: Desert Sand Features: -Salon table with shelf. -North American Maple and other hardwoods from eco-friendly, managed forest sources. -Shelf base. -Luxuriously upholstered rounded corner top. -Pro-plush deluxe 3-layer 3'' cushioning system. -Buttery soft, yet eco-friendly 100% PU Natursoft upholstery. 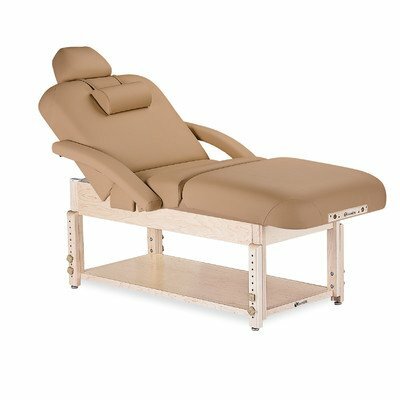 Product Type: -Stationary massage table. Country of Manufacture: -United States. Dimensions: -Max height: 33". Overall Height - Top to Bottom: -23". Overall Width - Side to Side: -73". Overall Depth - Front to Back: -30". Overall Product Weight: -156 lbs. 17017 Color: Teal Features: -Salon table with cabinet. -North American Maple and other hardwoods from eco-friendly, managed forest sources. -Cabinet base. -Luxuriously upholstered rounded corner top. -Pro-plush deluxe 3-layer 3'' cushioning system. -Buttery soft, yet eco-friendly 100% PU Natursoft upholstery. Product Type: -Stationary massage table. Country of Manufacture: -United States. Dimensions: -Max height: 33". Overall Height - Top to Bottom: -23". Overall Width - Side to Side: -73". Overall Depth - Front to Back: -30". Overall Product Weight: -192 lbs. 17015 Color: Desert Sand Features: -Salon table with cabinet. -North American Maple and other hardwoods from eco-friendly, managed forest sources. -Cabinet base. -Luxuriously upholstered rounded corner top. -Pro-plush deluxe 3-layer 3'' cushioning system. -Buttery soft, yet eco-friendly 100% PU Natursoft upholstery. 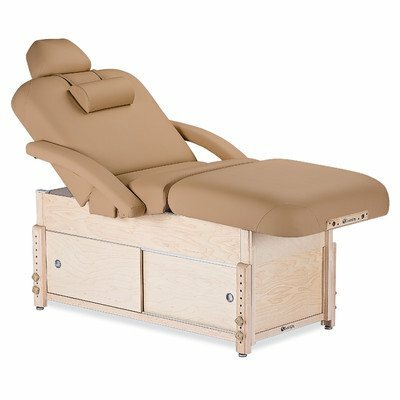 Product Type: -Stationary massage table. Country of Manufacture: -United States. Dimensions: -Max height: 33". Overall Height - Top to Bottom: -23". Overall Width - Side to Side: -73". Overall Depth - Front to Back: -30". Overall Product Weight: -192 lbs. 17013 Color: Amethyst Features: -Salon table with cabinet. -North American Maple and other hardwoods from eco-friendly, managed forest sources. -Cabinet base. -Luxuriously upholstered rounded corner top. -Pro-plush deluxe 3-layer 3'' cushioning system. -Buttery soft, yet eco-friendly 100% PU Natursoft upholstery. 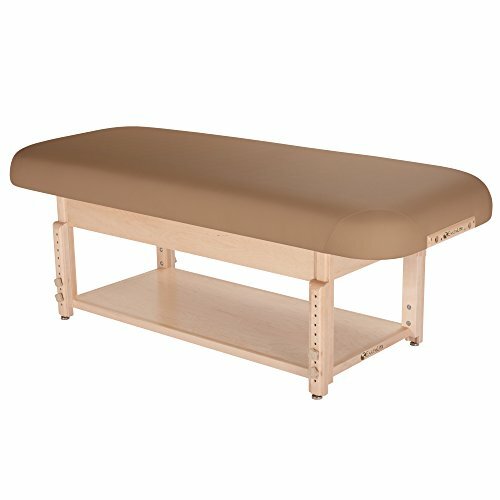 Product Type: -Stationary massage table. Country of Manufacture: -United States. Dimensions: -Max height: 33". Overall Height - Top to Bottom: -23". Overall Width - Side to Side: -73". Overall Depth - Front to Back: -30". Overall Product Weight: -192 lbs. Looking for more Earthlite Sedona Salon Stationary similar ideas? Try to explore these searches: Bohemian Revolution, Silver Hamsa Pendant, and Doras Magical Castle.